All the time and energy I spent thrashing around looking for a cure for my Carpal Tunnel Syndrome was heavily eating into my drawing time on “The Mark” mini-series, which is one of the main reasons it took almost a year to pencil and ink 125 comics pages. Plus, the act of drawing itself, what had always been my solace and escape, was frequently uncomfortable, and even painful. I had assumed, when I took the job, that I’d be able to freelance animation storyboards on the side. I tried doing that on the Batman Animated TV series, but had to hand in the storyboard half completed. This was definitely a dark period in my life. 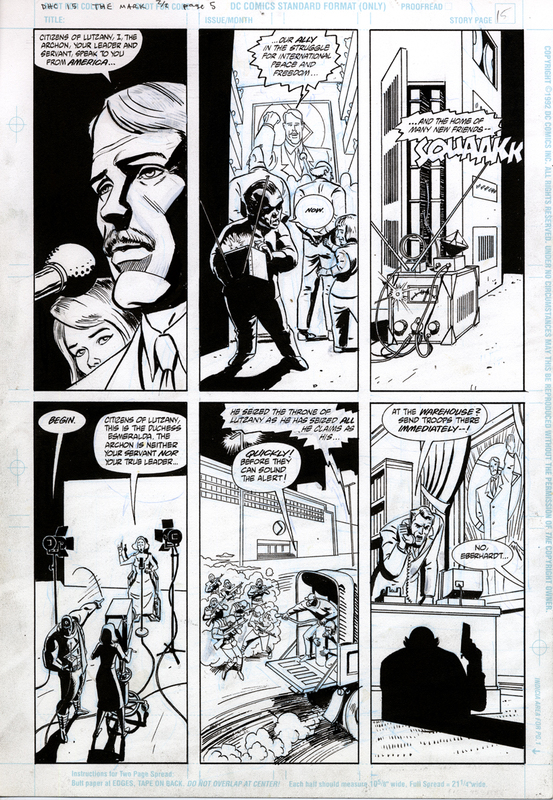 This is page #5 from Dark Horse Comics #15, “The Mark: What Goes Around”, written by Mike Barr, drawn by Brad Rader, published in December, 1993.